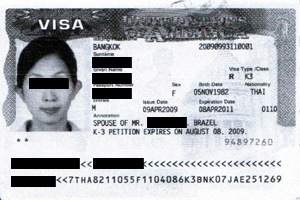 I spoke with U.S. Immigration Legal Advisors for the first time in December, 2007 about helping me and my fiancee complete the visa process to come to America. Eight months later in July, 2008, my fiancee and I were on a plane headed for Charleston, West Virginia. My fiancee had a very pleasant experience as the Thai ladies working with the law firm helped here in every possible way. They escorted her to everything from getting her passport to getting medical exams. The law firm made sure that I had all the documents necessary to get the visa application improved. More importantly, they practically held my fiancee’s hand through the whole process of gathering documents, getting everything translated, and preparing for the interview. The entire process was very relaxing for the two of us, and all for less than I would have spent on one additional trip to Thailand. I highly recommend this law firm in Thailand.